Definitely better than the first book. 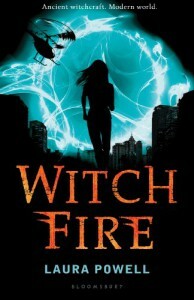 From what I remember Burn Mark was a bit slow and hard to follow because there were just so many characters, but Witch Fire starts off with plenty of action and it was much easier to understand. The best part about the book was the witchwork. Most of the books that involve witches have them casting spells and waving magic wands, but not this book. The witchwork requires a little more work than that and I think that's what made the story stand out. The Devil's Kiss, the Inquisition, and the superstitions really added a whole level to the story. The characters were pretty interesting as well. Lucas still doesn't know how he feels about being a witch and he struggles with what he thinks is the right thing to do. Should he blindly follow WICA or listen to Glory? Glory is still my favorite character. She's brave and strong-willed unlike other YA heroines, but she isn't completely invincible. I thought the other characters were kind of boring. The government agents all seemed the same and I wasn't a fan of many of the side characters simply because I found them annoying. They just seemed to be there when it was convenient. Lucas and Glory's parents were barely there and Lucas' father lets him go across the world to find Glory. That right there is not something that should have happened if his father was actually being a father. I'm pretty sure most parent's wouldn't let their children go to the capitol of witch crime. There was a bit of romance between Lucas and Glory and I really enjoyed it. I knew that eventually it would happen and it didn't take away from the story. Their relationship really developed over the first and second books and I felt that it was the only way their relationship could have gone. The ending actually surprised me. I had guessed about something, but it wasn't even close to what actually happened. Now that I think back, there were very subtle hints about the twist and it just made the story that much more enjoyable. * I received this book via Netgalley in exchange for an honest review.